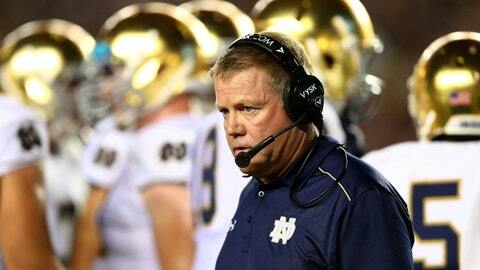 Could Brian Kelly wind up coaching the Giants someday? At age 69, Tom Coughlin is the oldest head coach in the NFL. There are rumblings every season that Coughlin might decide to retire, and it remains a possibility that Coughlin could call it a career if the New York Giants miss the playoffs. If that does happen, there is some belief that Notre Dame head coach Brian Kelly would be a candidate to replace Coughlin. If #Giants have an opening after this year, #NotreDame’s Brian Kelly is a name that GMs pair with that job, based on his traits. Coughlin probably isn’t going anywhere. He may be the only two-time Super Bowl champion coach that ends up on the hot seat in Week 8 every season, but it’s highly unlikely that the Giants will fire him — even if one of Coughlin’s former players thinks he needs to go. Kelly would be an interesting candidate for an NFL head coaching position. He has a record of 51-21 in five-plus seasons as coach of the Irish. He took the team to the BCS National Championship Game in 2012 but lost to Alabama.